The night the prisoners died, Hickman was on duty as sergeant of the guard for Camp America’s exterior security force….A moment later, two Navy guards emerged from Camp 1, escorting a prisoner….When the van reached the first intersection, instead of making a right, toward the other camps, it made the left, toward ACP Roosevelt and Camp No. Twenty minutes later — about the amount of time needed for the trip to Camp No and back — the paddy wagon returned….The guards walked into Camp 1 and soon emerged with another prisoner. They departed Camp America, again in the direction of Camp No. Twenty minutes later, the van returned. Hickman, his curiosity piqued by the unusual flurry of activity and guessing that the guards might make another excursion, left Tower 1 and drove the three quarters of a mile to ACP Roosevelt to see exactly where the paddy wagon was headed. Shortly thereafter, the van passed through the checkpoint for the third time and then went another hundred yards, whereupon it turned toward Camp No, eliminating any question in Hickman’s mind about where it was going. All three prisoners would have all reached their destination before 8 p.m.
Hickman says he saw nothing more of note until about 11:30 p.m, when he had returned to his preferred vantage at Tower 1. As he watched, the paddy wagon returned to Camp Delta. This time, however, the Navy guards did not get out of the van to enter Camp 1. Instead they backed the vehicle up to the entrance of the medical clinic, as if to unload something. Hickman […] asked his tower guards what they had seen. 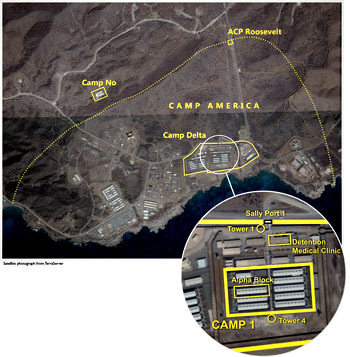 Penvose, from his position at Tower 1, had an unobstructed view of the walkway between Camp 1 and the medical clinic—the path by which any prisoners who died at Camp 1 would be delivered to the clinic. Penvose told Hickman, and later confirmed to me, that he saw no prisoners being moved from Camp 1 to the clinic. In Tower 4 (it should be noted that Army and Navy guard-tower designations differ), another Army specialist, David Caroll, was forty-five yards from Alpha Block, the cell block within Camp 1 that had housed the three dead men. He also had an unobstructed view of the alleyway that connected the cell block itself to the clinic. He likewise reported to Hickman, and confirmed to me, that he had seen no prisoners transferred to the clinic that night, dead or alive. There’s more at the link. The evidence here isn’t bulletproof, but it’s strongly suggestive that the official story was a coverup. It’s worth reading the whole thing.